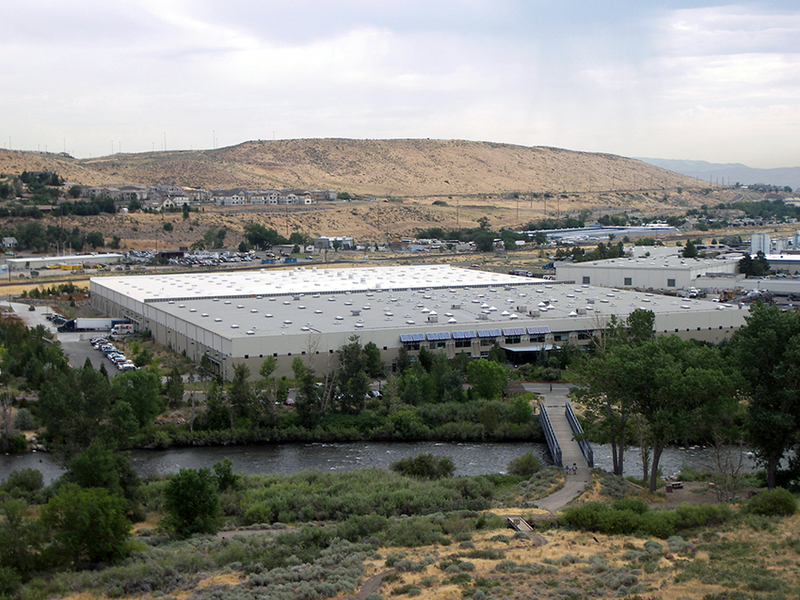 The expansion of the west coast distribution center achieved Nevada’s first LEED Gold Certification from the US Green Building Council in 2006. From the use of local and recycled materials, water and energy efficient fixtures and appliances to environmentally responsible landscape design, this facility strives to lessen its impact on the surrounding areas. To protect the nearby Truckee River, light-colored pervious pavers were used throughout the site, including the parking lot, reflecting solar heat and allowing water to percolate back into the ground. Detention ponds integrated into the landscape help capture runoff from the roof, filtering it naturally before it reaches the soil. Sand and oil separation units installed at the receiving dock proactively filter out contaminants before runoff heads into city storm drains and the river. A building site planted with natives coexists much better with its natural surroundings. So instead of planting thirsty plants and turf, a landscape design consisting of native plants, shrubs and trees was utilized. The local vegetation relies mostly on available precipitation and attracts native wildlife, including birds, mammals and insects. To further reduce water consumption, waterless urinals, low-flow toilets and bathroom faucets are used throughout the facility. In addition to conserving energy, natural light improves the indoor environment and increases productivity. Skylights that track the sun and translucent roof-mounted smoke vents were used to reflect natural light into the service center. To further conserve electricity, all light fixtures are equipped with photo sensors and motion detectors that shut them off when not in use. Ultra high-efficiency boilers power the facility’s radiant heat system. R30 insulation in the roof and R12 rigid insulation on warehouse walls help retain heat in winter and keep the building cool in summer and a night-flush vent system replaces the hot air of day with cool, nighttime air in the warehouse eliminating the need for air conditioning.